‘gig pack’, the work of brazil-based designer gustavo brenck, is a convertible scooter backpack for everyday use. the aluminum device is attached to a nylon backpack, complete with notebook compartment. when not in use for travel, the scooter’s rear segment is folded inside the backpack, nonetheless retaining space for other items. for riding, a user simply zips apart the backpack, fastens the front and back wheels, and secures all bag straps to prevent them from getting caught on the ground. as a scooter, ‘gig pack’ sustains a weight of up to 90 kilograms. its large rubber wheels offer increased durability. designboom has received this project from our ‘DIY submissions’ feature, where we welcome our readers to submit their own work for publication. see more project submissions from our readers here. Do EVERYTHING within your power to make this a reality. I swear I will buy at least 4 if this becomes available. Good start…needs more work due to the extra width created by the back pack.this seems to reduce the ability to bank over when riding the scooter which would be a pain. This could lifted higher to prevent this? If this is sorted would defo have one and spend many hours in the park with me boy…keep going top idea. it will be heavy with all those scooter stuff. so it is a cool design but will be heavy to carry it around with that small wheel, and it avoids it to be a real fun. that mitigates the backpack role of the design Id it functions 90% as scooter and 10 as backpack. I like that the bag is behind the steering column on this one, might give better balance. Being a backpack instead of a suitcase is nice too. I think the main idea is to ride everywhere and pack it up once you’ve arrived at your destination. I hoppe that brake will be present! Esse é Designer. Muito bom meu jovem. Quanto custa e onde acho pra comprar? give it 2 wheels on the front – so it can also be used as a ‘doll-trolley’? Get this on to Kickstarter.com – NOW! If this is suitable for light off-road (gravel road), it is bought. All solutions which are available disturb me in running or are not comfortable for longer down hills. One big wish beside the light off-road capability would be that the backpack don’t lies against the back, because of the sweat. i think it would be good for people who have to walk to their house.And it could be useful when trying to get to a certain place without any transportation available you could use the scooter. The GIG Pack will have problems in production as its infringing on existing patents etc. Interesting concept, but like Kat said; would be better to just make a backpack with a scooter “holster” for a Razor or something. If you’re really using this to scoot somewhere, it would be easier to just wear your backpack. Looks like it’s trying to solve a problem that doens’t exist. i want to buy this product but it’s imposibble to find it in istanbul. This would be a good idea if the back pack had a battery pack and an electric motor to drive the scooter. The aluminum frame is bulky and overkill for just a gliding scooter, I think one could do with just the plywood deck. If you look at skate boards they just have a plywood deck. Otherwise I agree with the other posters, just strap a razor scooter to your current pack. 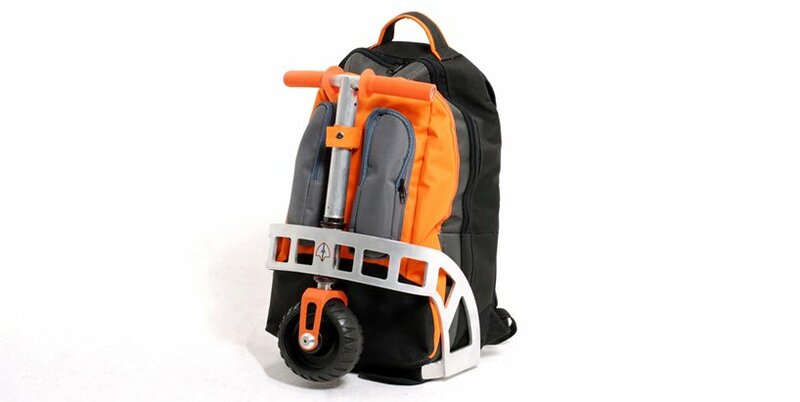 This is a very nice design and it\’s interesting to see how many other version of the scooter backpack are out there, I\’ve just been made aware of 3 that are currently on the market and wouldn\’t be suprised to find that there are more. Is this a recent phenomenon? Can anyone let me know if this has gone from design to production? I have been looking at scooter backpacks for my 9 yr old son for a Christmas present but nothing on the market comes close to this … any store suggestions (other than Amazon, Walmart, Target, Toys R U, Dicks Sporting Goods, Big 5 Sporting Goods etc welcome. At this point I’d even buy a prototype from the designer!! Hola, En México, donde o cuando se pueden conseguir?